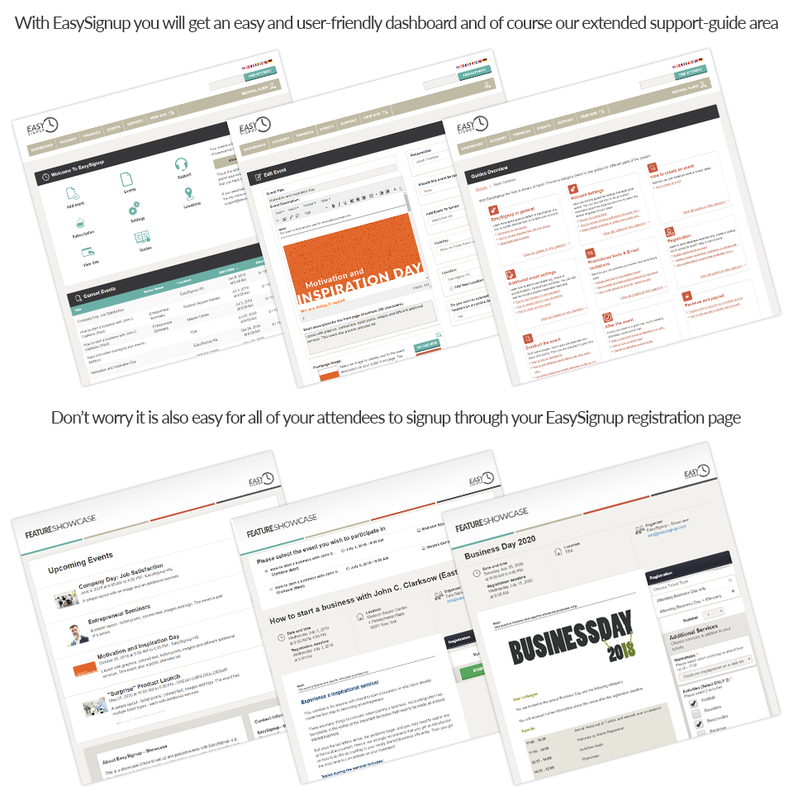 EasySignup.com is a signup system that suits events in many sizes, from small customer presentations or staff events to multi-day conferences with accommodation and simultaneous workshop flows. EasySignup is an online signup system that makes managing an event simple and easy, whether it is an event for your customers, a seminar, a conference or the annual Christmas party. Attendees sign up through a secure system, allowing you to spend your time and energy on other and more important tasks for the event while EasySignup handles the signup process and administration. Online signup system Reviews Recently Reviewed! EasySignup has met all my expectations with regards to an Event registration & administration tool. Pros: Easy to get started. Intuitive system. It solves the enourmous task of registration, administration, and contact with attendees, payments, etc. It is easy for an administrator to share relevant bits of information with a team (e.g. lists of participants). It also works perfectly for the attendees. Cons: EasySignup has a function that allows the administrator to share links for easy check-in of attendees upon arrival. At the moment this function is not optimal because it requires you to generate separate links for each check-in host/device at the event. It would be easier if a single link could be shared between several devices. Also we have experienced that if an wrong participant is checked-in by mistake, it can be difficult to correct the mistake. Another issue is refunding in the case of cancellation of an event: At the moment it seems you have to refund each attendee one by one. It would be useful to have a button for cancelling the event and refunding all attendees. But these are really minor issues, which will probably be solved in the near future, as the team behind the software is usually very responsive to user feedback. Pros: The ease-of-use is great and with a customer service second to none, I can highly recommend this product for arranging conferences etc. It features a rich customisability, and I have the highest confidence in the service. Cons: The overall look could be more polished. 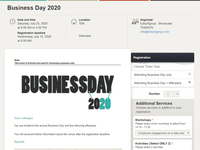 Also the look could be more brand-oriented so that an organisation could promote the signup page better on its own site. It means a lot to know that you have confidence in our service. EasySignup is an amazing tool. It works 100%. We love it! Pros: It saves us SO much administration time! Easy to use - easy to set up events/courses - easy to refund payments - and easy for our costumers to sign up. We haven't experienced any technical problems during our 3 years with EasySignup. Cons: We don't really have any complaints - we just wish we had discovered EasySignup earlier, to save us a lot of time. Glad to know that we helped you save many hours of administration. That exactly what we wish to achieve. NemTilmeld is a great tool. 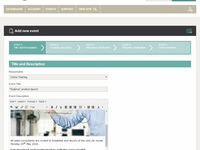 It's easy to use, locigal setup and the overview of events is brilliant. Pros: I have a numerous possibilities to setup the different events. No matter if it is evening lectures or arrangements with accommodation. I can easely create options according to the accomadations or the selection of food. I can handle different types of tickets due to participants' membership, prices e.g. If we plan similar events in the future, I can make a copy of allready held events and save time on the new creation. Cons: If I should mention anything missing it could be the possibility to make events with several dates like a serie of 1 day a week in 10 weeks in a row. I haven't suggested this to the support team yet. But all others ideas from our user side has been taken care of with gratitude. Overall: A logical tool, that saves a lot of time and administration. Easy to use and a great overview. Thanks for the kind reviews. Please remember to contact us if you any questions or comments. Pros: It is versatile and can be configured in the most obvious ways for ticket sales. In addition it handles different types, add-ons etc and it is easy to open up the sales again for another 15 minutes if you have some late guests. Secure payment is very important to us. Like the frequent updates on new features. Cons: It does not seem to integrate to other platforms. The settings that they call universal can still be overruled by yourself which has been confusing to me. Nice to hear that you event registration is running smoothly. Pros: Easy to navigate, easy to refund, nice overview of participants. Nice presentation of event to customers/members. 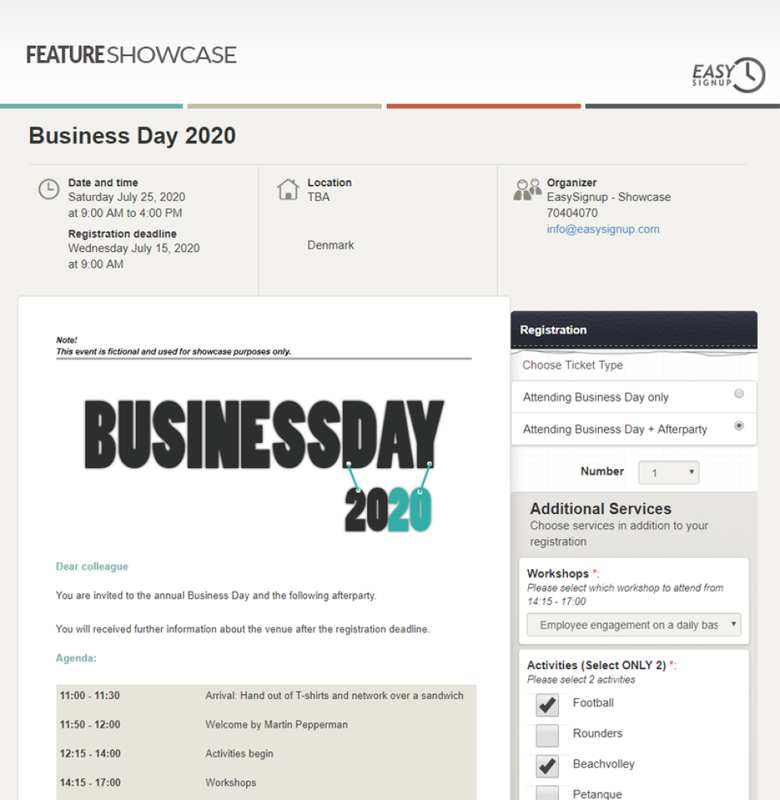 Cons: There is a fixed template for the online presentation of your event - it would be nice with some possibility to customize. What a fine review. Thanks for taking the time to give us some feedback. Pros: Really helps when arranging gatherings - especially when payments are involved. Ensures we can use creditcard payments without having to have physical devices to do so. And helps us make the attendeelists etc. Cons: At this time i have nothing negative to say. We were one of the very first users on the system and have enjoyed using it. There is a learning curve to setting up complex payment-types - but userguides and support can deal with it. Thanks for your loyalty. We are happy to know that you still find the system useful. Pros: I got 48 localchapters, with two editors in each, with this system, they get access to paid events, and a better support. Cons: If you have very specific needs, this may not be available yet. But tell, and they might develop it. Or may you can for a fee get it developed. 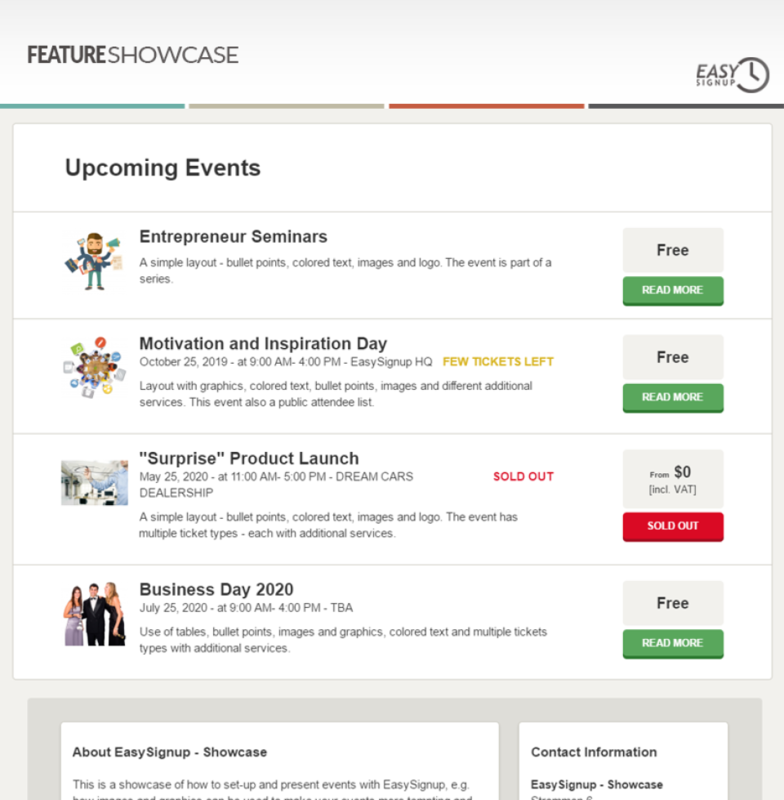 Happy to hear that EasySignup helps to streamline your event management. Especially in terms of the many volunteer local chapters. Pros: Easy to use. When signups come in, I don't have to check everything all the time, they can fill out all the information I need for the conference. Different prices, different lectures, lunch or not, it's all in there. Cons: Can be difficult to find a specific setting - but I doubt it can be made more intutive than it already is. We are glad that the system supports you when organizing events. Used it for a 150 persons conference administration including financial registration and handling. Pros: Its easy to set up and configure to your event, And the system funktions very well with registration, control and the booking. Cons: Its very difficult to find negative or bad things about this programme. So far we have not discovered any misfunctions. Overall: A smoothly running administration of our meeting and conference activities. 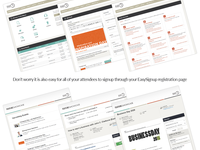 We are happy to hear that EasySignup helps you manage your conferences. Pros: We have used the system for a number of years and are fully satisfied. A system that makes it easy to handle upcoming events. The support and help have a fast and efficient reponse time. Cons: There are not immediately any negative things about this platform. It evolves and improves constantly. We have been using EasySignup for the last five years. It is extremely useful and time-saving. 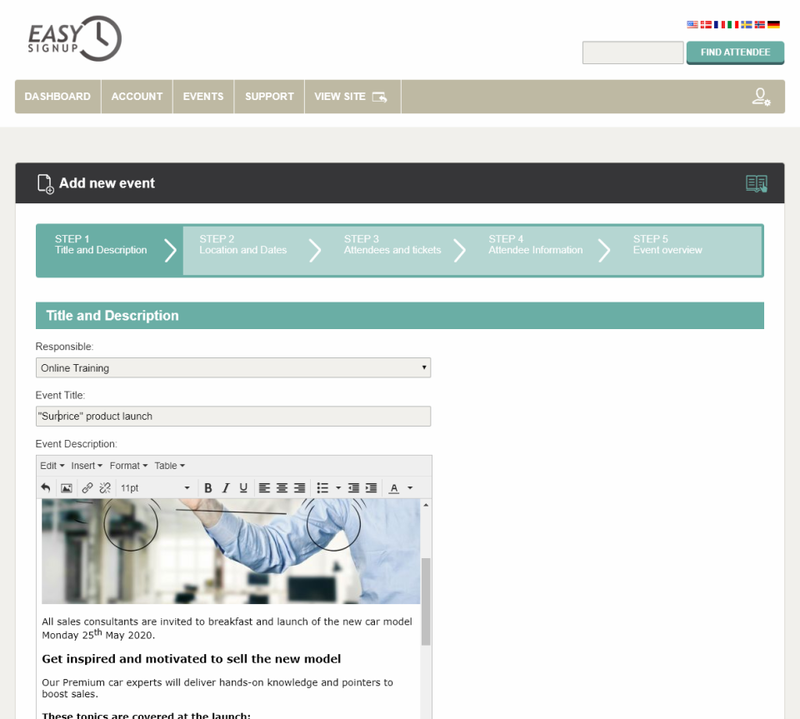 Pros: EasySignup helps us manage our meetings and seminars. 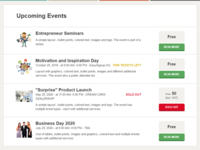 Setting up new events is a breeze, and the system handles everything from bookings, cancellations and payments, to printing name tags and communicating with participants. The interface is attractive, and integrates well with our website and social media platforms. Cons: The user interface is a bit formal, and the customizing options few - but I guess that reflects the limits of our budget rather than of the system itself. We are glad that we can help you save time and resources that you can put to better use in your organization. Pros: Easy to use. It only takes a very short time to create a new event, and then the system makes the rest of the work. Cons: At this moment I think most of the odd things from ealier versions are gone, so I have to say, I lige everything. Thanks for the review. Have a nice "blood donor party" in May. Pros: The system is very easy to use for the administrator, and it's simply to plan an event. We had great feedback from our customers, which found it easy to use. Cons: I don't really have any cons, because it's very usefull, easy to use, and as an admin. you get all the support you need, as well as relevant news from time to time by e-mail. Nice to hear that you have a positive experience with EasySignup. Cons: Not 100% fit for our optimal use but close enough. Especially looking at the price. Great to know that you experience a high level of "value for money". We have used EasySignUp for a couple of big events and it was really a big help! Pros: The professional look and gathering of details from the participants. The great and quick customer support. Cons: Some features were not so user-friendly, so I needed the customer support. It is however a couple of years ago, so it may be better today. How nice to hear that you found EasySignup helpful. Thanks for taking the time write a review. Pros: For user, who will sign up for an event, EasySignup is very easy to use. For use managing the event we can tailor made it are getting very useful information and statistics out. Very fast and good support. Maybe as a first time administrator it can be a little difficult to understand all the functionalities. I'm happy to read that you have any "cons" towards the system. Pros: Very easy to use, and easy customization of the entry form, which does not require pre-registration of the user. I'm glad to read that you find the system useful. Has everything I need in a signup software. Pros: Full of features, constant development. Before I think of it, EasySignup has developed that new feature. When laws change, EasySignup changes accordingly. No sweat. Cons: With a software with all those features, it can be hard to find the one you need to use. Well, a compromise with all good software. Thanks for taking the time to write a review. It is highly appreciated. Pros: The ease of use and the ability for us to have people pay with card. This would not be possible otherwise for our small events. Cons: Some elements of the design could have more polish. Overall this is not really an issue since the system is easy to use. Thanks for giving us some feedback. We hope to service you for a long time. this is very good app i like to recommending to my others friends. Pros: this software is very helpful i like to use it. Pros: Easy to use. Well designed. Fine possiblilties to choose when you want to send the invitations. Easy to edit in an existing arrangement. Cons: Missing evaluation after an arrangement. All the informations is in an arrangement, so it should be very easy to implement an option that makes it easy to send an evaluationsheet to the participants. An evaluation feature is on the "wish list" for the future. Pros: The easy of use and gives a form control and managements of events. This males it easy to track and adjust in events and have a form idea of attendance. Cons: The list could probalbly by expanded a little but a minor issue. There is most likely a way to do This, but need to be clarified and made available for export to other systems. Thanks for your review. Happy to hear that you are satisfied with the system. The support online is very helpfull, and by phone you get qualified help immediately. When you have an event it's very easy to send out reminders before and questionnaires after. Cons: It would be nice if you could put you own .pdf into to an event . But overall we are vey happy with this software. I'm happy to know that you find our support swift and helpful. Pros: Always great overrview on arrangements, and easy to use. If you have arrangement with include payment, no problem. Also if you have to make a refound. Cons: Its take a little while the first couple of times to find out, but after that i easy to use. And again, always great support. Pros: Easy to use and and it give us a quick overweiv over subschribers and their payments and for them to pay. We do not have to ask again and again for paymen. Cons: I cann't get in mind I have somthing I do not like about this software maybe because I'm not setting our arrangements up. Overall: It is opened for our members 24 hour a day to use and they feel secure about their suscribs and payments. 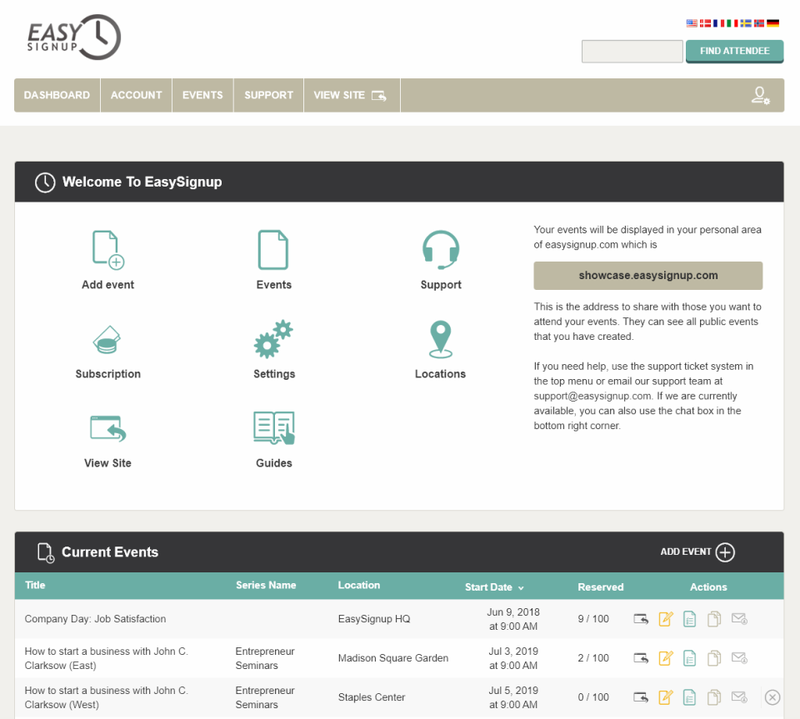 Good to hear that EasySignup eases your event management. Everything goes. From 10 people meetings to 300 people conferences, they are equally easy. Pros: It is very easy to manage. The submission/participant overview is excellent. Payment is very easy to handle. Extraction of data for external use is easy and user friendly. Event-specific information is easy to add as an optional/mandatory selection prior to submissions. Cons: Changing option after payment is not as easy as it could be. Additional selections to a submission cannot be setup as a checkmark list but has to be setup with individual yes/no options. Overall: Overview prior to an event. Easy money handling. More efficient communication with external partners. Thanks for the review and recommendation. Pros: We use it in our employee assosiation for creating events and one of the main benefits is the ease of creating an event. Especially the handling of payments is great, if for instance an employee can't attend the event I can just remove him/her from the event list and they won't be charged for that event. Cons: The user experience could be better. At first glance it seemed a bit confusing how to use it. Luckily the people behind the product made some great video tutorials. We are happy that you find det system useful.